Yes, I did see the Fabrikor case, and it's definitely sturdy, with nice sealed sides. What i didn't like is that the base flares out and is pretty bulk (esp. with the cross-bracing). I know it's to make the case stable and strong, but it takes up too much space as a floor foot print, and being the neat nut that I am, it will probably annoy me to get the vacuum cleaner caught up in the x-bracing. It's an expensive $429, but I figured it would be my only display case. It's large and very sturdy, but... the latching system on the front door is magnetic, so nosey cat paws can very easily claw it open, and cat vs. toy wrestling mayhem would probably follow (H & E are really nosey cats, compared to Mr. Humphreys who liked to nap, follow you around, cuddle, and nap some more--too dignified to be nosey ), so I had to pass on it. I sorta regret not buying the Super 7 vintage metal cases when they were up for grabs, they were really nice. Martin is a fantastic guy creating absolutely enjoyable works. As I know I've seen him around these parts before, here's a 'wave' and a "Hello, Martin!" I love that painting that you scored; I hadn't realized that the original was still up for sale. Congratulations on landing it! A print of Kaiju Zoo hangs here in my home office - it was actually my first print of his that I added to my walls, closely followed by enough additional prints of his that I've lost count. I've also been fortunate enough to also add a handful of his originals to my walls over the past couple of years. I found out just yesterday that he has a new show opening in early 2016 (Feb 12, I believe it was), so I've already set aside funding for another round of purchases. Anyway, my apologies for the brief derail, but I can't let a spotting of Martin's work go without commenting on just how much I like the fellow and his paintings. They've brought an immeasurable amount of enjoyment to me. Thank you D . Um... I should add that the unpacking is going to be on the turtle slow side (lots of vintage toys to wash ). Yes, I will take photos. Also, I finally got my greedy paws on a Martin Harris original water color--Kaiju Zoo! P.S. Thank you for mentioning the plywood and long screws option--makes total sense! Hey I was searching for a post on the IKEA Detolfs and found this great thread. 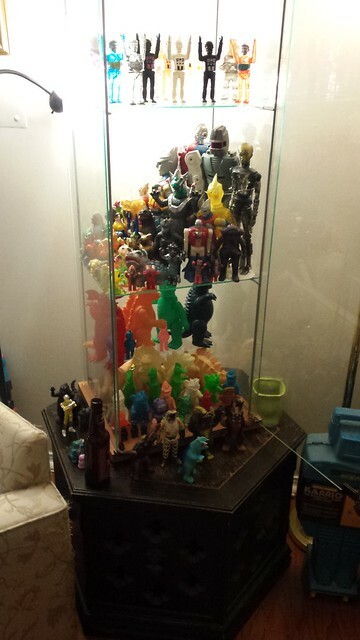 I only had these cases and boxes displaying my Microman and Micronauts, and Henshin Cyborg, etc. I've been consumed with moving and really haven't had much time to think about toys for most of this year. Packing up and moving EVERYTHING gave me a chance to reconnect with my collection. Here is the "Tetris" style display that I have going on so far. The black case has sliding glass doors and used to be my Dad's knife display. He never bought us any Star Wars toys and I can't thank him enough for that. FUREEK and poysntixels like this. and it's made it much easier to access and enjoy my collection. Has anyone found a cheap furniture turntable or "lazy susan" that is strong enough to use with a detolf? poysntixels, Alebrije and decypher like this. If you don't mind open shelves, this shelving unit from IKEA is only $10.00 more than a DETOLF @ $80.00 and can hold more than twice as many toys. The middle 3 shelves are glass; the top & bottom shelves are a nice quality particle board with a solid finish. The frame is made of metal and comes in black-brown (I have one of these and it looks more like a warm, dark gray) or white. They also make smaller shelves in the same aesthetic that are pretty much half the width of the larger model. Link to VITTSJÖ shelving unit HERE. I recently saw the Fabrikors in person and tried all I could to make them ship it to Mexico for me, couldn't do it. Didn't have a lot of time either but totally fell in love with them!! Also, Dennis' displays still blow my mind. Here's a the only display case I have. ^^ Love it. I always enjoy pics of mixed collections! Bandai is producing a neat set of inexpensive risers that are due out in October. These look like they should fit mini or fight figures nicely, although standards will likely be too large. Waterbear and decypher like this. 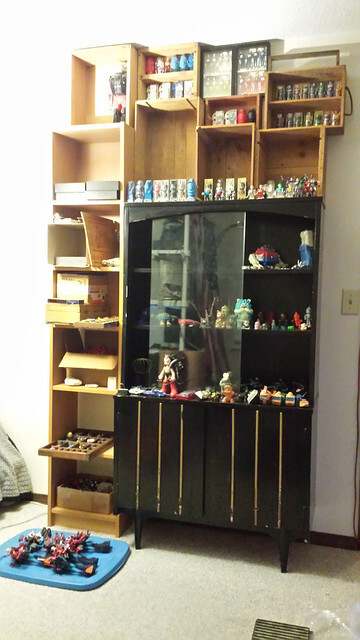 I used to use a white Ikea Lack Bookcase (6' x 3') as my toy display, and man, was it wonderful to look at. it was big and spacious, only 4 nice thick shelves, and all the colorful paint jobs from my hundreds of toys just popped! Just a couple of my cases. 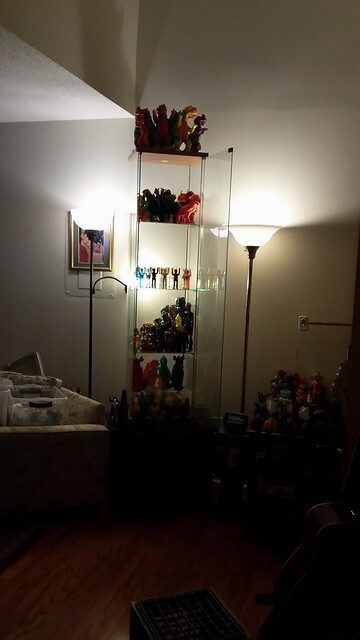 Detolf and Billy bookcase with UV plexi in a frame as "doors"
hellopike, Geekabilly, The Moog and 5 others like this. hellopike, wingnut0, 3wing and 5 others like this. The Moog, poysntixels and T.J. like this. Just stumbled on the Ikea Fabrikor display case, on their web catalog. It looks like a great case! Just wondering if anyone has used this for their toys? It's even lockable! Sxt_bucho and Alebrije like this. I had a look at this case when I was at one of their stores a few weeks ago. Nice sturdy looking case however I didn’t like the width of the metal frame. Too wide to see the stuff inside clearly from a lot of angles although I liked the glass top. @Vombie might well have some opinions. Unfortunately the Nornas has a slight gap along the door frames (same as the detolfs). Also noticed that the Billy cases are back too. I really wanted to buy those S7 vintage metal cases, when they came up for grabs, but it would have been a bit difficult to transport and drag up the stairs. They were really nice though! p.s. I noticed Walmart has Fabrikor cases on their website, but for double the price! Yep! I really dig these shorter ones. colinkahn, Geekabilly, Russblue11 and 4 others like this. colinkahn, Russblue11, SstatusSkuo and 2 others like this. Man, Vombie. You started me on both Fabrikors AND my Elegab obsession haha. Thanks! You're very lucky to have cats that don't diet on vinyl! Yeah they are mostly indifferent towards the kaiju, just the occasional sniff. Vombie, colinkahn, Geekabilly and 2 others like this.